The end is near and Lifehacker is looking back on their favorite how-to articles from 2010. We found at least half of these interesting, including the hidden HTPC, lockpicking, and micro-TV-b-gone showcased in the image above. But you can also find tips on using your WRT54G router, stacking malted beverages, and making things glow through chemistry. If your heart goes out to our plague carrying house-mates there’s a no-kill mouse trap. They’ve even included a hack to add a USB port to your car… an article which we covered back in 2009. Enjoy! 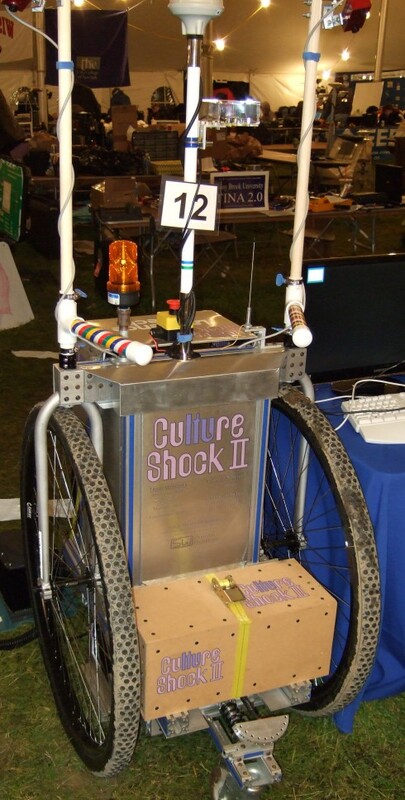 Culture Shock II, a robot by the Lawrence Tech team, first caught our eye due to its unique drive train. Upon further investigation we found a very well built robot with a ton of unique features. 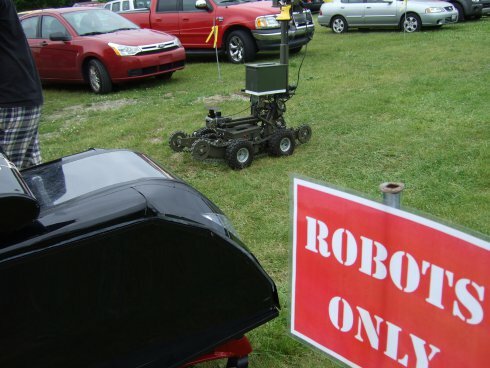 The Intelligent Ground Vehicle Competition (IGVC) is the precursor to the DARPA Grand Challenge, and in many ways it is just as difficult. 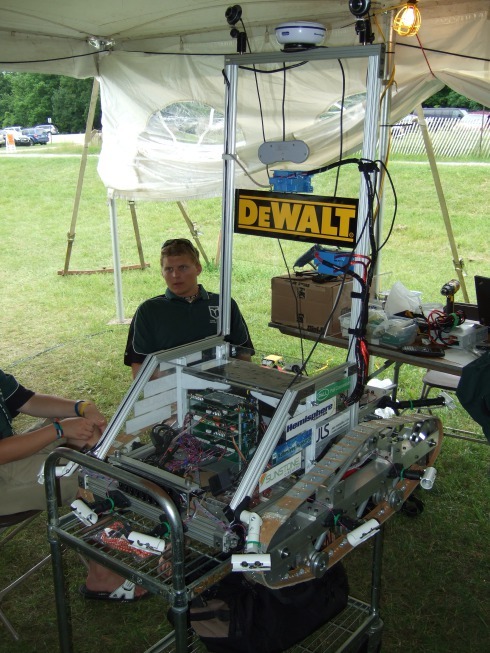 We have the pleasure of being at the competition this year with the Tennessee Technological University Autonomous Robotics Team. The teams at the competition pull off some amazing home-brew robotics, so we’ve decided to do a short section on some exemplary robotic hacking each day of the competition. Today’s robot comes from the York College of Pennsylvania. The robot, dubbed “Green Lightning”, features an impressive set of custom made hardware. Ask any engineer what originally sparked their interest in technology, and almost universally the response will be a Hollywood film or TV robot — Star Wars’ R2-D2, the B9 robot from Lost in Space, or Short Circuit’s Johnny 5, to name a few. Engineers need a creative outlet too, and some pay homage to their inspirations by building elaborate reproductions. 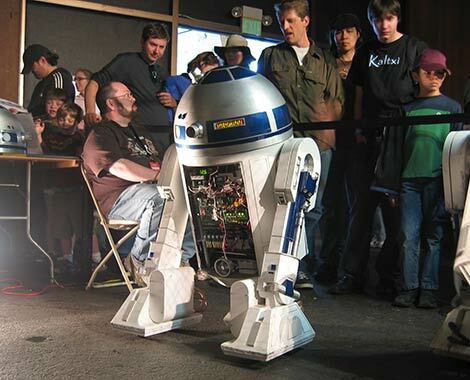 At this year’s Maker Faire, droid-builders had their own corner in the center hall, their work ranging from humble craft materials to ’bots surpassing their film counterparts in detail and workmanship. 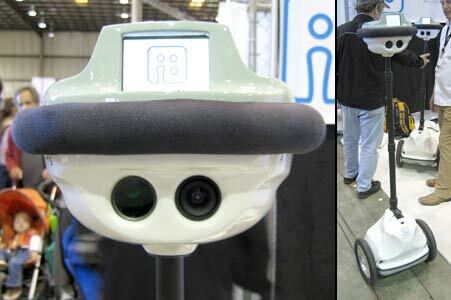 No, it’s not an extra from Wall-E. “QB” is the latest telepresence robot from Silicon Valley firm Anybots. QB combines two-way videoconferencing with a Segway-style self-balancing platform. The idea is to provide mobility and more natural interaction than desktop-tethered conferencing can provide. 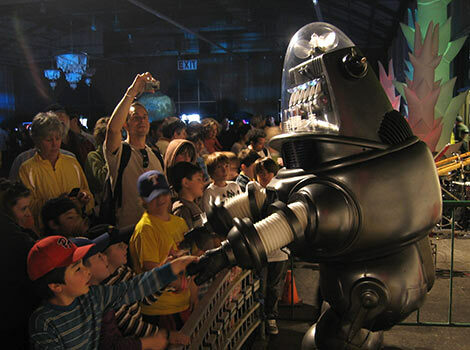 The 35 pound robot’s battery runs for six to eight hours, and the telescoping head allows the eye level to be adjusted to match the user’s natural viewpoint. What looks like stereo vision is actually a single camera on the left eye and a steerable laser pointer on the right. Shipping this October for $15,000, QB will appeal mostly to businesses with specific telepresence needs. This is half the price of their prior QA model — and in time the technology may reach the mass-market level. Until then, we’ll just have to amuse ourselves by remotely attending meetings with our ankle-nipping Rovio robots.